Supernatural 6x22 "The Man Who Knew Too Much"
Whoa. Absolute power corrupts absolutely. I believe that is the appropriate saying at this here juncture, uh huh. But I'll get to that. We have some other things to discuss first. The episode started off with Sam running through the streets, past this Castle Storage sign that I know I've seen on this show before, so that should've been my first hint that all was not as it seemed. He ran ran ran away from some police cars into a bar, where a comely lass played by Erica Cerra of Eureka fame greeted him with skepticism and mild alarm. He quickly informed her that he was without memory of who he was and what he was doing. She tried to convince him that he should go to a hospital, but he was sure that would be a bad idea, that he had somewhere he needed to be. He gets a quick flash of memory after spying an HP Lovecraft book in the bar (another hint - who just has his books lying around), and because she doesn't want this handsome amnesiac to go off on his lonesome, she drives him to the hotel he saw in his memory flash. At the shady Nite Owl motel, the room is covered in hunter paraphernalia, and Sam gets another flash, this time a longer one of when he was last with Bobby and Dean on the hunt for purgatory. They were meeting Ellie, the former resident of purgatory, you remember, only she is mortally wounded, thanks to Crowley and Castiel needing her blood for a ritual to open up the door to purgatory. She dies, and Cas shows up, telling Dean that he'll save Sam once all is said and done. Save Sam? What does that mean? Cas then puts his finger to Sam's head and --boom! Back to amnesiac Sam, who now remembers Bobby's name, along with his own, and finds a book with Bobby's address in it. At this point the girl wants to bail (did we ever find out her name?) but after they get shot at, he forces her to come with. And who shot at them? Someone who looks just like Sam? What?! 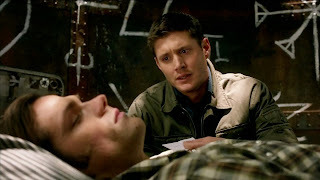 Okay, this time we go back to the present day, and it turns out Sam's in some kind of dreamscape zone in Bobby's basement, with Bobby and Dean watching. Bobby wants to continue the hunt for purgatory, but of course Dean is hellbent on fixing Sam. Bobby reminds Dean that Cas wants Dean to be thinking exactly that way, so Dean concedes that Bobby should go figure out where this ritual will be taking place. Back in dreamzone, Sam runs off to confront this other Sam, and we find out that this other Sam is a broken off piece of the Sam whole. The soulless piece, in fact. And he wants to take over the whole shebang. Luckily, even though soulful Sam is not as heartless as soulless Sam, he is able to overtake him nonetheless, and gets the white light soul-ness from soulless Sam back inside him. Whoa, that was confusing to write. In any event, he remembers everything, and it turns out that bar girl was someone he had sacrificed back when he was in his soulless year, so she disappears now that he remembers it all. He heads on for Bobby's place. In the real world, Bobby comes back with Balthazar, who tells them where Castiel and Crowley are holing up. Dean is reluctant to leave Sam, but leaves him with the address in case he wakes up. They head off. Meanwhile, at Che Wherever, Castiel had informed Crowley that he was basically reneging on their deal and would be taking all of the souls for himself. He used the phrase "flee or die" a lot here. Crowley fled. Balthazar goes to check in with Castiel, because remember he's being a double agent, only Castiel senses that he's lying, that he's no longer really with him. And he kills him! Cas! Back with Sam in dreamscape. Once he makes it to Bobby's place, he comes face to face with the last piece to the soul puzzle. The bit of him that was down in hell, the bit that he's been blocked from remembering for some time now. In order for him to wake up in real life, he's got to reintegrate that part of his soul, though hell soul tells him this is not a great idea, and that he won't be able to handle it. But Sam is determined (because he's got to come to Dean's aid, naturally). He takes him in, and does some crazy seizing in real life. As Bobby and Dean arrive at the angel-fortified huge house place of Che Wherever, a giant cloud of demonic smoke comes battling through the sky, sending them inside the Impala tumbling. Impala! Oh no! Not again! Inside, Crowley shows up with Raphael, his new partner. Now it's Castiel's turn to be scared. He hands Crowley the jar of blood needed for the ritual and bops away. Crowley and Raph get to ritualizing, with a momentary interruption by Bobby and Dean, who managed to hobble out of the overturned Impala into the place, but don't have any luck stopping them. Once they complete the ritual, however, something is wrong. Nothing's happening! Cas pops back in, with a strange sort of grin on his face. And Crowley immediately gets it - he gave them the wrong blood before, and already did the ritual himself elsewhere. Cas does the weird grin again, and Crowley gets out there lickety split. Which leaves Raphael to look crazy scared. And then what does Cas do?! He explodes him with a snap of his finger! Just like Lucifer did to him! What! Cas! Cas then turns to Dean, who also looks freaked out. With good reason, I mean, really. He tries to get Castiel to see sense, that he needs to let loose all of the extra souls, because it's making him not think straight. But Castiel is tired of listening now that he's got all of this power. At this point Sam makes his grand entrance and attempts to stab Castiel with one of the angel-smiting swords. It goes through, but nothing happens. Why? Castiel then explains - it's because he's not an angel anymore. He's their new God. And he straight up demands that they kneel before him and declare their devotion! Or else. Gulp. - I wanted sooo much more of dreamscape Sam stuff. That all seemed to happen pretty quickly, considering. - And how is Sam going to deal with the Hell stuff? He seemed to be having a tough time of it. Is it going to get easier? Harder? I really hope they explore this next season and don't just shove it under the rug or something. - Jared has had a lot of opportunities to play different versions of Sam, and he's done them so well. It really shows his range. Great job! But please get a hair trim. It was really distracting me tonight. - Castiel's disturbing grins. Whoa. Castiel with too much power is definitely not a good thing. Will they be able to de-soulify him, or will they end up having to find a way to kill him? That's probably going to be one of the big questions of next season, I would imagine. - I'm trying to think where this finale ranks among the others and among the season as a whole. Do I need to make some updated top 10 lists this summer hiatus?! "You seem even more constipated than usual. Maybe get you some colon blow?" - Crowley ... is that actually what he said? I still want the writers to be logical about Sam's hell days. Was he better kept there in the cage enduring what is apparently unimaginable torture for all eternity? Gah. It does seem he was able to avoid insanity, but I think we will definitely see the fallout of his time in hell next season. How could it be worse than the 40 years or so Dean spent being tortured and then doing the torturing? I shudder to think. And like I said previously, I think Cas had good intentions, but the souls and that absolute power have made him insane. And I still think if Dean had had knowledge that this would drive Cas mad (meaning the audience would have that knowledge too) it would have been easier to be on the Winchesters' side all along and hoping that Cas fails. Honestly, I was thinking Cas had a point about avoiding a second apocalypse, but if they'd clued us into what would happen next, I might have sided with our boys sooner. p.s. in agreement about Jared's acting- he really got the chance to stretch this season and lived up to the challenge. This was one of the better penned episodes of a lousey season. Don't blame Kripke for this blame the other producers for not giving Kripke what should have been a two episode arc. Maybe then we would have explored deeper into Sam's mind and discovered exactly what he went through. The whole Cas is now God thing was undewhelming and I think the reason for Sam's mental oydessy was to mask the big reveal for season 7. Another thing I would like to point out is your belief of Cas' insanity coming from his newfound power and the millions of souls. I think not. The roots of Cas' insanity go way back to season 4 when he defied the angels and was killed as a result, when God pieced him back together in season 5 and Cas found out he was no longer welcome in the big boys club that probably messed him up a lil bit. After all Cas was a loyal soldier to God, and when he began to see the Apocalypse wasn't such a good idea they cast him out. Cas' then started on the path to locate God himself after all he has the power to stop the apocalypse and right everything. Wrong, Cas was betrayed when his own father refused to interfere. This loss and betrayal in my opinion were the catalysts in sparking Cas's insanity. Only further brought on by Raphael's civil war. This whole thing isnt so much to stop a lil civil war amongest Raphael and heaven, but as I see it God has failed him so he will make a better God. The souls however are probably driving him further into madness. How would you like it if while grieving over losing your father and respect from your brothers and sisters this is added to your mind millions of voices telling you this and that. That would make me angry and smiteful too I would think. Laura - I totally agree about having been sort of on Cas' side. I could see his point. What else was he supposed to do, really? If we had known where it was going to go, then obviously we would've been against it, but they (the Winchesters) just seemed to be against it because it meant making a deal with a demon, which is a little the pot calling the kettle black, but, well, that's sort of the Winchester way sometimes. Darren - I wonder how much the souls actually "talk" to him or if they're just sort of... power. If they do talk to him then that would definitely be a lot to deal with, but I'm not entirely sure that's the case. One of the things we'll find out next season, I'm sure. And yes, Cas has been doubting his father this whole time and looking for signs of his existence and care, but he never really desired power for himself. Ok if they are not talking to him then they certainly are contributing to his madness here is a guy who just absorbed an infinite amount of power and energy and now he can basically do anything first thing tear Raphael in half with your mind. It's like you said absolute power corrupts absolutely. One question remains. Why did Cas want the souls to begin with? We learn that the angel war is about to be lost so Cas in a desperate attempt needs souls to empower his side. OK then but what will they do? Will they be human like spirits? Will the souls be given new human forms, handed the special weapons to battle Raph's forces, or did Cas know all along that absorbing them would grant him unlimited power? The latter makes logical sense to me, it's easier to believe Raph and Cas going after the souls to absorb them because they know their power would be limitless. To me Cas seems to have the knowledge that he would become this GODlike being almost from the start. Why he swapped the blood jars and performed the ritual himslf rather than just snap out of his delusions and side with the Winchesters. Blame the writers. This was the poorest season in terms of planning ahead and more so than season 1. They were so focused on this revelation cliffhanger and didn't think out the plot beforehand.